These delicious crepes are totally worth the effort. It may seem like a lot of steps, but it actually isn’t so much, and goes quite quickly. These are really a favorite of ours. Mix the batter for the crepes at least 1/2 hour before making crepes so it can properly hydrate. Make sure you sieve the chickpea flour as it does get lumpy/clumpy. Place all the crepe ingredients in a bowl and whisk to blend. I use a fork. For the sauce mix the soy yogurt and vegetable bouillon or spices and herbs in a small bowl. Slice the onion and sauté until glassy in a lightly oiled frying pan. When done, remove the onions from the pan. Slice the mushrooms and add to the pan, sauté until soft. Remove from the pan and place in a bowl for use later. Place the spinach in the frying pan and lightly sauté until just wilted. Remove the pan from the heat. When the batter has bubbles on the top and appears dry, flip over to lightly cook on the 2nd side. when done, remove and set on a plate to be filled. Meanwhile, to fill the crepes, lightly spread the crepe with some of the yogurt sauce. 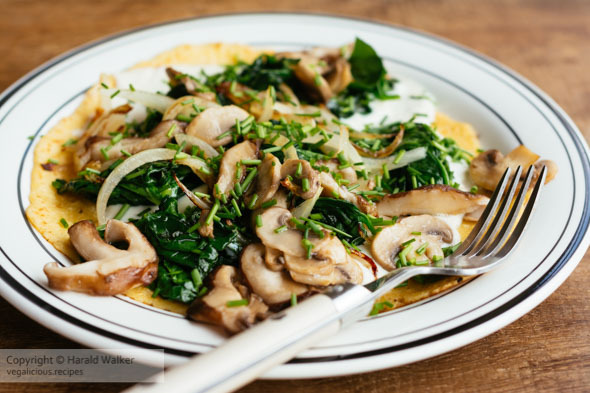 Place some of the sautéed spinach on top, then some of the mushrooms and topped with some of the onions. Sprinkle chives on top. Do this for each of the crepes and serve warm. These are great as a lunch, served a with a nice salad, or a lovely brunch or a special breakfast in bed morning. 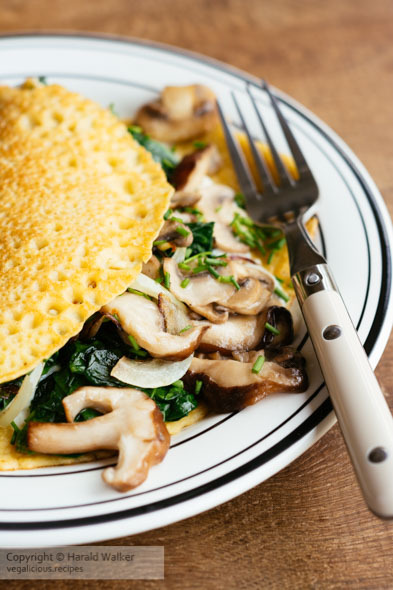 Posted by Chris Walker on March 8, 2019 in Main Dishes, Mushrooms, Spinach.